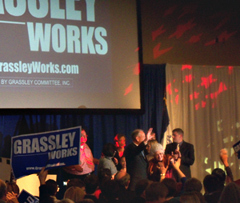 Senator Chuck Grassley greets supporters after winning another term. 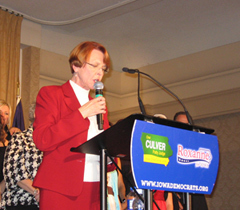 Grassley criticized President Obama. “We had a president that was elected on a platform of change. They thought he was going to change Washington, but Washington is very much the same. He wanted to change America. The country has rebelled against that in this election,” Grassley said to cheers from the crowd of Republicans.